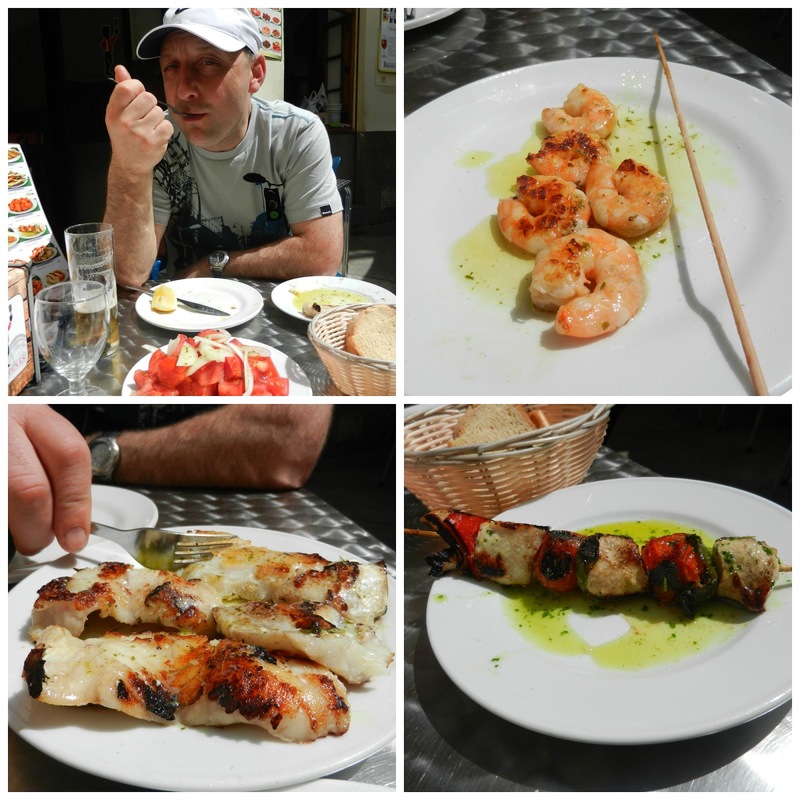 When Rich came to visit, he flew to Málaga. Not only were flights more regular than those to Seville, the route was available from his local airport (Bristol) and the tickets were cheaper - an all round win! He arrived on a Wednesday night and I got the last bus to Málaga after work to meet him. With Thursday being a national holiday (weird I know), we decided to take advantage of my day off to explore the city before I introduced him to my new home town. After a late night for both, we slept until we woke up - alarms are not for holiday!! Our bed in the Juanita Inn was particularly comfy, so by the time we ventured the 10 paces to the main shopping area we were just in time for an early lunch...whoops! Not a great start if you're packing a whole town in to a day. But perturbed we were not! We made a pit stop at the tourist office for maps and attraction opening times, before settling in a bar just around the corner. Deciding it was heresy to order anything but seafood whilst by the seaside, this was the resulting order. So a garlicky chicken kebab might have snuck its way in too! Over lunch, I said that we should set out a plan for the day. Richard automatically replied 'where are we going then?' Any one who knows me or has been on holiday with me knows that I'm a serial planner. Daily itineraries, down to where to eat and what time we should get the restaurant (I know, such a loser!!). However, as Rich had ridiculed my planning when I'd asked him about where he wanted to visit in Seville a few weeks earlier, I had made a conscious effort not to. When Rich clocked that I hadn't even looked at what there was to see in Málaga, he was slightly taken aback. Full of surprises me! Paying the bill we wandered off in the direction of the cathedral which towered above a pretty restaurant lined, befountained square (I know its not a word, but now I've made it a word, SO THERE!). Before we managed to find the entrance, we got side tracked by Málaga's finger painting maestro who positions himself right out side the gates. ...intrigued?! Check out my post on him here. After paying our entrance fee (£5 for adults and a fairly sizable discount for students), we were greeted by some fairly fabulous plaster work, ornate icons and beautiful carvings in the choir area. Though many trip advisor reviewers complain about the entrance fee (some leave reviews to moan without even being inside) I think its vital to help preserve what you have to pleasure of viewing on your visit. That's what your entrance fee does people, so stop your whinging!! We took a little stroll in the Cathedral garden afterwards which is home to a mix of fairly traditional sculptures with some modern installations. Next stop was the Alcazaba. Visit Málaga dubs it the most emblematic monument of the city and who were we to argue? It seemed like a solid enough recommendation to us. Right in the city centre, elevated on a series of levels, the Alcazaba was built before the Battle of Hastings even began! Testament to the Moorish past of Andalusia, the Alcazaba was built primarily for the protection of the city but secondly as an Arabic palace. With many tranquil patios to explore, walls to climb and unrivalled city views to capture on film, the Alcazaba makes for a nice afternoon wander. At only 2.20€ for regular entrance and only 60cents for students, the bottle of water that will be a much needed companion in the afternoon heat will cost you more than the wander!! Robert, the bar owner, who wouldn't stop talking long enough for the photo to be taken. A one man whirlwind, this guy is willing to give you his opinion after knowing you ten seconds...conversation gets deep and personal in a matter of seconds but his 'I've been there done that got the t-shirt and have the answer to everything but I'm not cocky' style made him instantly likeable. One pint turned in to two (hindsight tells us we should have gone for the 10€ beer jug) - You should defo pop in for some life lessons if you're around! Next and last on the agenda was Picasso. Born in Málaga, he left when the city was a young man and never returned, though his work (in a purpose built museum no less!) and his childhood home stand as proud reminders of his seaside Andalusian roots! As a huge Picasso fan, the museum with its hall after hall of works was a treasure trove. Rich mainly went to appease me I think! We ended up playing a fun game of 'Name that painting'. Anyone who is familiar with Picasso will tell you that its often hard to distinguish what the hell it was supposed to be in the first place (no disrespect of course!). The names of works in the museum are mostly descriptions of the subjects so it was hilarious trying to identify them without looking at the tag first. Could be a game translated to many modern art galleries around the world. Whilst the art museum was a wonderful place, I found Picasso's family home and the exhibition hall attached a bore to put it nicely - stick with the main event and you won't be disappointed. After another (slightly disappointing) fishy dinner which took us past sunset, we decided that we should probably see the ocean, as we hadn't set foot near the water all day. So off to the marina we went. After circling the marina, lusting over the multimillion pound yachts and rolling our eyes at the horrendously overpriced restaurants, we turned the corner at the lighthouse to find ourselves at a near deserted Málaga beach. After sitting on the sand, listening to the crash of the waves and watching the cruise ships and fishing boats bob along, we decided it would be heresy not to order the famous BBQd sardines with and ice cold CruzCampo. A round of drinks at 'Gin Tonic' bar formed the end of a perfect if packed day in the city. 10 guesses what this bar's principle tipple is. The bar staff are certainly gin experts, from the different low notes of the gin, to which is the best kind of tonic to put with it - they sure can teach you a thing or two! Word of warning...they don't speak a word of English! Best pointing fingers at the ready!